Asphalt shingles, also known as composite shingles, are the most popular type of roofing material used in American homes. In fact, eight out of ten homes in the US have asphalt shingle roofs. How did such a simple roofing material beat more “classic” roofing materials such as brick and slate tile in terms of popularity? A closer look at the material’s strengths gives us the answer to that question. Availability – Asphalt shingles are more affordable compared to other roofing materials. They are also the most easily produced, so running out of stock is rarely, if ever, a problem. Energy Efficiency – Asphalt shingles offer good heat resistance, making it easier for your appliances to regulate indoor air temperature, and, in turn, lower a home’s overall energy consumption. Versatility – Asphalt shingles are available in different colors and sizes, making them a viable option for almost any well-known home design. Ease of Installation – Since asphalt shingles are lightweight and simple, a professional roofing company like us can install them quickly and easily. Furthermore, replacing asphalt shingles is a lot easier than replacing high-end roofing materials. Nature-Friendly – Although asphalt shingles are non-biodegradable, they can easily be broken down and recycled into paving material after being torn off a house, reducing their environmental impact by minimizing landfill waste. 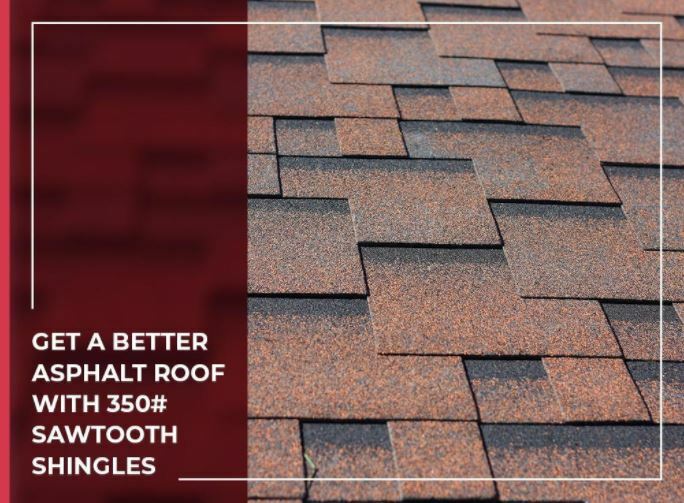 Our 350# Sawtooth shingles capitalize the benefits of standard asphalt shingle roofing and further improves upon them by offering superior performance. Our unique manufacturing techniques make 350# Sawtooth shingles more flexible and have increased granule adhesion, which means they have a longer expected life span and better overall durability compared to other asphalt shingles. 350# Sawtooth shingles keep a fine balance between form and function. Our uniquely shaped shingles create a dynamic look that keeps your asphalt roof from appearing dull and flat. We’re the only roofing contractor that offers this type of shingle, so you can’t find such a versatile material anywhere else. Ready to get a Sawtooth roof for your home? We’re more than happy to help. State Roofing is the leading provider of roofing products and services in Tacoma and Kirkland, WA. Call us at (360) 205-3100 or fill out our contact form for further inquiries or to request a free estimate.